Since 2004, Larlin's Home Improvement has helped homeowners in Ansonia renovate garages into attractive, safe and organized spaces. Whether you're looking for a better storage solution for all of your unused "stuff" that's begun to clutter, or you want to enhance the living space of your home by renovating your Ansonia garage into an additional bedroom, mother-in-law suite, home office or at-home gym, the knowledgeable experts at Larlin's Home Improvement will get the job done right! Looking for an affordable way to improve the quality of your life and living space? Garage renovation in Ansonia is one of Larlin's Home Improvement's specialties. We offer a wide variety of garage renovation services in Ansonia to ensure all expectations are met in a timely manner. Our attention to detail, quality craftsmanship and 15 years of handyman experience provide faultless results for your newly renovated Ansonia garage. Let Larlin's Home Improvement help to improve your day-to-day living needs by transforming your cluttered or unorganized garage into a fully functional space! Call (203) 267-0607 with your Ansonia garage renovation wish list. We will work with you to discuss the plans of your garage renovation in Ansonia and create a design that best fits your wants a needs. We look forward to serving you! Tired of Tracking Dirt onto Your Garage Floor in Ansonia, Connecticut? Having Larlin's Home Improvement coat your garage floors with a durable, tough epoxy coating will give your garage floors a long-lasting finish that is not only beautiful but practical. No more dirt or oil stains on your garage floor. 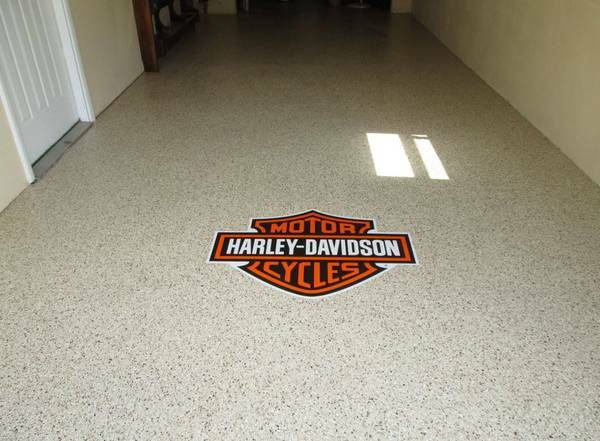 Epoxy coating Ansonia garage floors is one of Larlin's Home Improvement’s specialties. One gleaming floor at a time, epoxy coating will provide low maintenance durability that you’ve been hoping for. Call (203) 267-0607 today for a free coat for garage floor epoxy in Ansonia, CT.
5★★★★★ - "This is my second experience with Larlin's in roughly a year. They were fabulous the first time and even better with the recent project. Very timely and clean once again. The work was entirely on the roof and their performance was flawless. It's nice to work with a company that is reliable and consistent. Thanks again to Larry and his team." 5★★★★★ - "After finding Larlin’s online on Angie’s list, I contacted them to get a sense of pricing on kitchen appliance installation. Unlike other appliance vendors who demanded full payment at the time of booking, Larlin’s gave me a written quote (with ranges based on unknown variables) and scheduled the work within a few days. Larry and Brandon and came out to complete the work. They were thorough, professional, and did a great job at a reasonable price. It feels like I have a new kitchen! I’m already in the process of quoting other work with them. I highly recommend their work, and I’ve already passed their card onto a friend!" 5★★★★★ - "Brandon and Tony were excellent. They courteously, competently, efficiently completed five minor projects in my new home. I'd certainly contact Larlin's, again, if I had additional projects." 5★★★★★ - "They were the best to work with. Very good price, very professional. I would recommend to anyone to hire them for any type of home improvements. I will hire them again in the future." 5★★★★★ - "They were fast and reliable. Fantastic job." 5★★★★★ - "Could not be happier with the work done at my home. The vanity installed looks better than I thought it would. They are very professional and everything is left clean when they leave. Would recommend them to anyone who needs work done on their home." 5★★★★★ - "Needed help putting up window blinds and install a baby gate. The guys were very personable and professional. They were perfectionists. Overall I am happy with their work. Definitely recommend hiring them!" 5★★★★★ - "Larry and his team are professional, creative and brilliant problem solvers when it comes to home maintenance. We have used them many times and have not had a single issue with any of their work. Great job!" 5★★★★★ - "They came in and replaced and entry door and storm door. The work was exceptional and they cleaned up after like I have never had anyone clean. Would recommend them to anyone who needs work done on their home. Very professional." 5★★★★★ - "A great job done with a difficult project, finished in less than a day." 5★★★★★ - "Mr. Larry and his son Brandon were very professional. They exceeded my expectations. I will definitely be calling them again for other projects. Did some extra things that were not on my list. I thank you both for the excellent work done." 5★★★★★ - "We absolutely love working with Larry and his team. They delivered a playscape swing set from Norwalk to New Haven and assembled it in time for my son’s birthday party. I would highly recommend working with the Larlins team on any home projects you are considering." 5★★★★★ - "You and your team did an exceptional job Larry, thank you very much. Very professional and very clean. I have your magnet on my refrigerator and I won’t be afraid to use it!! :) Thanks again!"